Award-winning, nationally bestselling author Kevin Henkes introduces second-grader Billy Miller in this fast-paced and funny story about friendship, sibling rivalry, and elementary school. 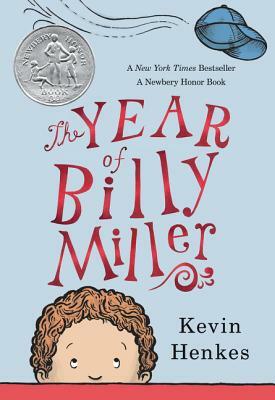 The Year of Billy Miller includes black-and-white art by Kevin Henkes and is perfect for fans of the Ramona books; Frindle, by Andrew Clements; and the Clementine series. The New York Times declared: "Henkes's delightful story is restrained and vivid . . . forgoing the overdramatic or zany, it shows the substance, warmth and adaptability of beautifully common family love." When Billy Miller has a mishap at the statue of the Jolly Green Giant at the end of summer vacation, he ends up with a big lump on his head. What a way to start second grade, with a lump on your head! As the year goes by, though, Billy figures out how to navigate elementary school, how to appreciate his little sister, and how to be a more grown up and responsible member of the family and a help to his busy working mom and stay-at-home dad. Newbery Honor author and Caldecott Medalist Kevin Henkes delivers a short, satisfying, laugh-out-loud-funny school and family story that features a diorama homework assignment, a school poetry slam, cancelled sleepovers, and epic sibling temper tantrums. This is a perfect short novel for the early elementary grades.